Organic molecules organize themselves to form a bridge between electrodes. A team of European physicists has developed an integrated circuit that can build itself. The work, appearing in this week's Nature, is an important step towards its ultimate goal — a self-assembling computer. 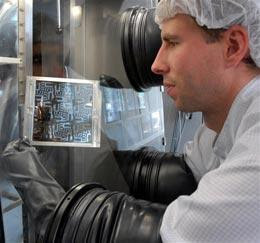 Today's computer chips are made by etching patterns onto semiconducting wafers using a combination of light and photosensitive chemicals. But the technique is being pushed to the limit as ever more processing power is being packed onto chips, requiring engineers to etch details just a few tens of nanometres across. So scientists are hunting for alternative ways to assemble even tinier chips. Letting them build themselves is, in many ways, the most obvious solution, says Dago de Leeuw, a researcher at Philips Research Laboratories in Eindhoven, the Netherlands. "The nicest example is DNA," he says. Our genetic code provides a set of instructions that can be used to marshal molecules into an entire person, and researchers would like to come up with a similar set of compounds able to organize each other into circuits. That's no small task. To make a circuit that is truly self-assembling, physicists would need to get insulators, conducting electrodes and semiconductor transistors to all link to each other automatically — something that is still a long way away, says de Leeuw.